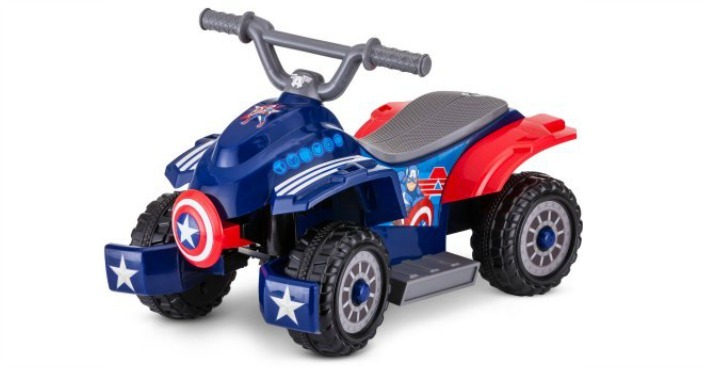 Marvel Captain America Toddler Quad Just $50! Down From $99! You are here: Home / Great Deals / Christmas Deals / Marvel Captain America Toddler Quad Just $50! Down From $99! Right now you can get this Marvel Captain America Toddler Quad for just $50 (Reg. $99) at Walmart! Marvel’s Captain America is here to save the day! Delight his littlest fans with a vehicle that they can ride to help him defend the countryside or your backyard! This quad is decked out in red white and blue and proudly displays Captain America’s shield on the front. It has easy push-button acceleration and will travel at 1.5 miles per hour. A six-volt rechargeable battery and charger is included. Kid Trax Rubber Traction Strip Tires make for a no-slip ride on slick and grassy surfaces. Win the battle over evil with Marvel’s Captain America on your side.